“Our decision to suspend these three routes comes after an in-depth analysis of their performance over the last four months, including the very measurable effects of the May 1st increase in departure taxes. There is no clear path to sustainably serving these markets under current economic and regulatory conditions” said Steve Schulte, CEO of Tropic Air. “We thank all our customers who have supported our efforts to build these routes. It is most unfortunate for those who have come to depend on these regional links, that in the end, we were unable to sustain the growing losses”. Passengers having ticketed reservations for flights with Chetumal, Merida and San Pedro Sula as part of the itinerary will be contacted and arrangements made for their travel to be completed or for refunds to be issued. According to Greif, the airline company is constantly looking for new routes and combinations to work. He says that if the current tax structures change, the company will revisit the routes. Meanwhile, its domestic service and the other destinations remain intact. Just wondering what the specific tax changes are. that prompted the cancellations. Routes were never profitable, the straw that broke the camels back so to speak. Last week Tropic Air announced that it would be suspending 3 of its regional flights partly because of the Barrow Administration's increase in Departure Taxes. "The reason why we sent out the press release today is that we hope that government takes this into consideration. The negative impact that is already had on one of our main players in the tourism industry. I think this is a sign that has already impacted. What if the international airlines follow suit, what if they begin to realize that it is too expensive, our flyers are looking at the numbers and then comparing to Mexico, comparing to Cuba, they are comparing to Guatemala, to Honduras, Roatan. They might say its best for me to look at the reef that is available in Roatan, let me go to Tikal and experience the Maya culture, I don't need to go to Belize because it's too expensive to go there. That is the question that we want the government to really sit back and reconsider its position on the increase and to look at how fragile the tourism industry really is and how do Belize fits with the Caribbean and with Central America. It's easy for you to move an airline somewhere else, that's one of the things that the government needs to really look at keenly,"
Government desperately needs the additional revenue from the increased tax to meet the fiscal targets it committed to in the renegotiation of Superbond 3.0. Last month, Tropic Air announced that it would discontinue its regional flights including its air travel to San Pedro Sula, Honduras and Merida and Chetumal in Mexico due significantly to the higher tax and fees charged by the Barrow Administration. In their public announcement Tropic Air’s CEO Steve Schulte noted that there was [quote] “no clear path to sustainably serving these markets under current economic and regulatory conditions” [end quote]. The airlines have been hit hard over the years with an increase in the rider’s fee and then an increase in the Departure Tax this year. In a report published in the Novedades Quintana Roo over the weekend, Mexican tourist officials lament the decision by Tropic Air, indicating that they made attempts to keep the flights going. Juan Alfredo Pacheco Cocom, who is the Director of Tourism Development for Othon P. Blanco, pointed out that they held meetings with officials from Tropic Air, offered alternative routes with potential in the market, but the decision stood. Cocom added that the flights from Belize are of major interest to them, and hopes that the connection can be restored soon. According to reports, in Tropic Air’s last days of flight to Chetumal they only attracted 3 passengers. In March, the Government announced that it needed 88 million dollars in new tax measures. Among the tax measures introduced was an increase to the Departure Fee for non-Belizeans to $40 dollars, which would raise 11 million dollars more for the Government. 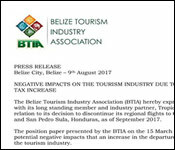 The Belize Tourism Industry Association has expressed concern about the implications of the tax increase on the industry.